Spinal assessment is a form of body analysis that looks at the curves of your spine in intricate detail. It requires a trained eye to understand what all the bends and twists mean and to understand whether they need to be straightened ‘or not’ as the case may be (there is a misconception that our spines should not be twisted or slightly bent, sometimes these differences are there for a reason and do not create any pain or discomfort and are best left alone) your practitioner will be trained to explain your spine to you. 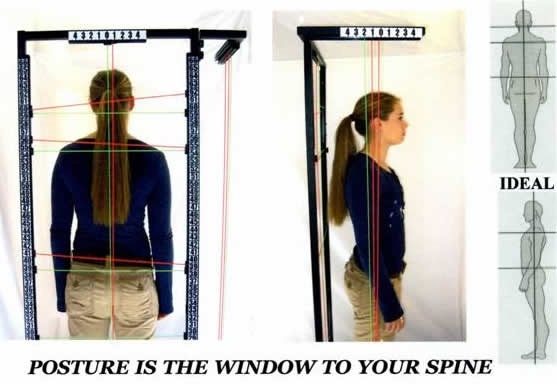 This serves as a ‘window to your spine’ you stand on the machine and various levels of your back are measured on there. You receive a picture of your back so you can see for yourself what is going on with your back. Your practitioner will explain what the picture shows explaining what the short term and long term effects could be for your body. Do I have to be in pain to have a spinal assessment? No you may just have a few minor twinges or no pain at all! It’s like visiting the dentist for a check up, we just want to check the health of your spine, and ensure no decay is taking place. Once I have a Spinal Assessment do I have to have treatment? The choice is yours, you will never be forced to receive treatment from any of our practitioners. The short and long term effects will be explained to you and if you decide that you would like to undergo the spinal correction treatment to prevent these issues from progressing further it’s up to you. A follow up spinal assessment can be scheduled if you decide not to receive therapy, to check the progress from one visit to the next. The spinal assessment would cost £30 which does not include a full medical history or orthopaedic examination. If you think you may want treatment on the same day you would need to have a full session which includes a medical history being taken, orthopaedic examination and clinical diagnosis (which is what tells you what the cause of your pain is) before any treatment can be given. The cost of this and a spinal assessment can be done at a reduced rate of £60. If you have any further questions relating to getting a spinal assessment done please contact the clinic and speak to one of our staff who would be happy to help.